Education is an important part of surveillance and case reduction. 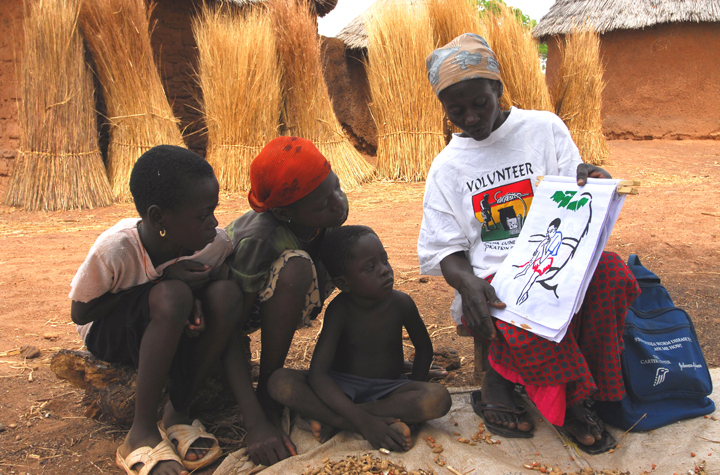 Here, flip charts are used in Wantugu, Ghana to show schoolchildren how Guinea worm is contracted and what they must do to prevent it. Education and low-technology measures to promote behavioral change are especially important because there is no medicine or vaccine to prevent Guinea worm disease. Credit: The Carter Center/L. Gubb, “INSTRUCTING CHILDREN,” The Global Health Chronicles, accessed April 20, 2019, https://globalhealthchronicles.org/items/show/4924.